There has been an abundance in the number of tags about numbers. Why, I wonder? I’ve received tags for the number FOUR, the number SEVEN and now Leah has tagged me with the number EIGHT. Her “cafe” goes a step further than merely serving coffee because now she would like me to list down 8 things about myself. Really, Leah? You sure…? Anything at all? It could be totally random and out of whack, you know…. hehehe…. I am an animal lover. And that’s exactly why I went bonkers at the Singapore Zoo a couple of weeks ago. Look look..baby rhino! Wahhhh…. check out the giraffes and the llamas! And ooohhh….. there’s a white tiger too! Oh and what about the orang utans…. 3. I have been breastfeeding for 18 months and still counting! My initial target of 6 months was stretched to a year and revised to 15 months. It has been a wonderful journey for both Ethan and me, and yes, I am in the process of weaning him now, but I know I will miss the experience when that happens. 4. I pout very well. My ex-classmate used to call it a “state-of-the-art” pout and in fact, she confessed that she would find something to say to me that would result in me producing a pout. I don’t do it that often anymore, but if the situation calls for it, I would and I certainly could. 5. I have no problems at all remembering lyrics of songs I have heard. I don’t make an attempt to do it, but I just can. Even songs from old musicals, these stay in my head years after I have listened to them. I can sing along to all the songs from Grease and Grease 2, and yes, even The Sound of Music. My hubby says a great portion of the storage space in my brain is used for this. Maybe…. but it is just something that comes naturally to me. And that’s a good thing, right? 8. I am immensely emotionally driven. I am affected by everything I see. In fact, I’ll be the first to admit that I cried when I watched The Little Mermaid. And I am sure I will still shed tears if I were to watch it today. And that’s only a cartoon! Hehe, althought you wrote about animals, World Wrestling Federation still flew through my mind. LOL! Will do this later on, got 3 outsanding tags already………2 from you. I’m so fatt, yeah! Will get on it ASAP… I still owe wennnn and ehon a tag each. LOL! And I watched Man Utd last night! (This is one BIG dissimilarity between us. LOL!) First silverware in the cabinet… hehehe. 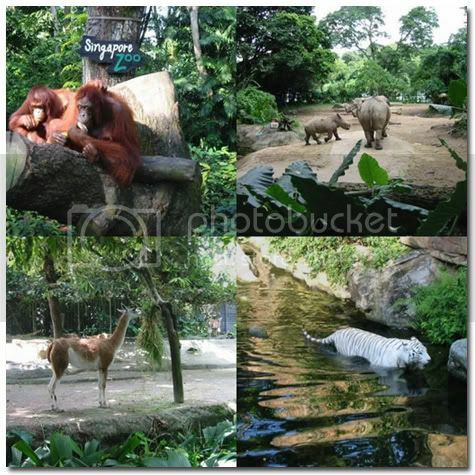 Btw, SG Zoo is one of my all time favourite! Even the Taronga Zoo in Sydney can’t beat it! The Giddy Tiger says: Yeah, I blame it on the slippery waxed floor! They should just carpet it la…like my old company! Agree with your wrestling comment. Thanks for clarifying too, cuz WWF always makes me think of big men that need more clothes badly. Want to see a picture of your pout. Puhleeeeeeez. Really curious to see if you can out do my missus. I get pretty emotional too. Sometimes I should take kleenex to the movies instead of candy. My kids almost died sitting next to the crying fat man at the last Star Wars movie. The Giddy Tiger says: All the more FATT for you too, SA! Lemme look for a pic of me pouting to see if I can outpout your missus. Heh. Sounds like your missus and me have a lot in common too. a fren of mine also like that, very accident prone, so she no need to do housework, hehe…. The Giddy Tiger says: How I wish I could get away with that! Thx for doing the tag, now I know a little more about you. The Giddy Tiger says: No problem. I hope your sis has gotten over her proneness to bruises!